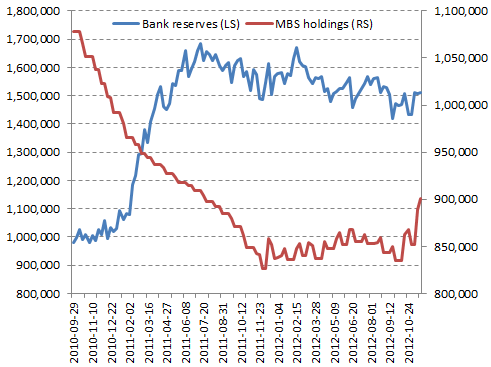 The Fed's latest securities purchases are still not having much of an impact on bank reserves (see discussion). The net effect of Fed's recent activities is equivalent to sterilization, although this is probably not what the central bank had intended. The result is similar to the ECB's SMP (Securities Markets Programme), which was (usually) sterilized by auctioning off term deposits (securities purchases increase reserves, while term deposits "drain" them). Without the increase in bank reserves, the US monetary base has been stable (unlike during previous balance sheet expansion programs). 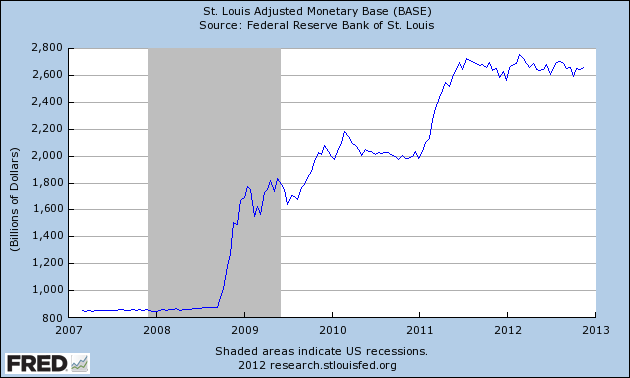 So far the Fed's securities purchases have not translated into quantitative easing (no "money printing" just yet).